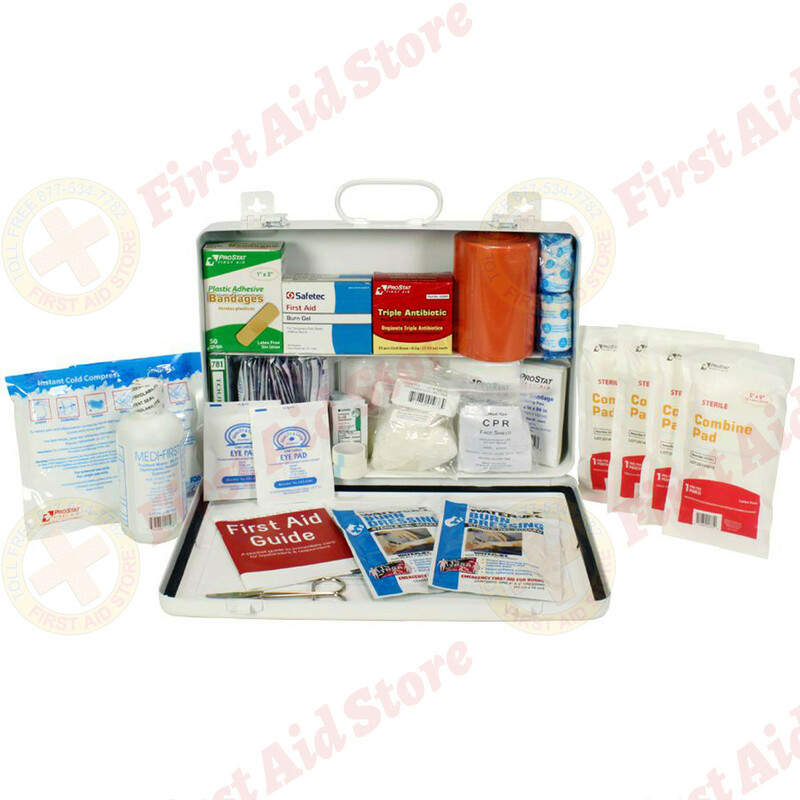 Urgent First Aid Kit, 198 Pieces, ANSI Class B, 50 Person in a gasketed portable and wall mountable powder coated steel case. 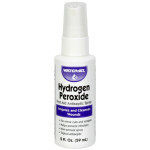 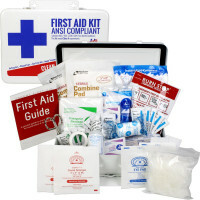 First Aid Store offers this Urgent First Aid American Made solution for your ANSI and OSHA First Aid Kit and Supply requirements: If you have anything more than a simple office environment, you should have a "Class B" first aid kit - this first aid kit is the best value metal ANSI B First Aid kit, designed with a broader range and quantity of supplies to deal with injuries in more complex or high-risk environments. 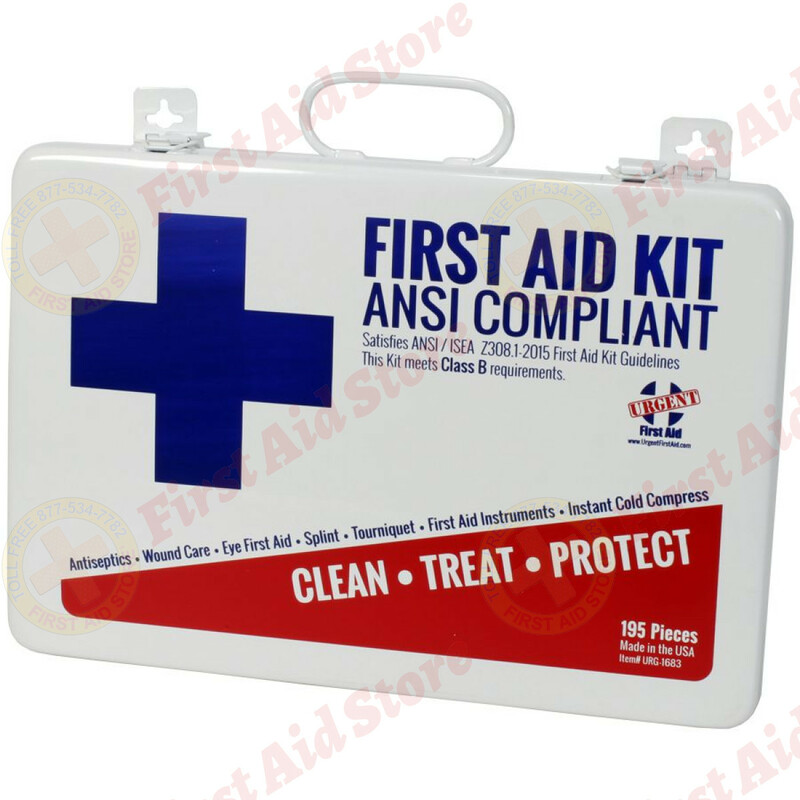 This kit meets or exceeds OSHA and ANSI 2015 Standard fill requirements, so you know you and your employees will be covered with the new ANSI 2015 requirements. 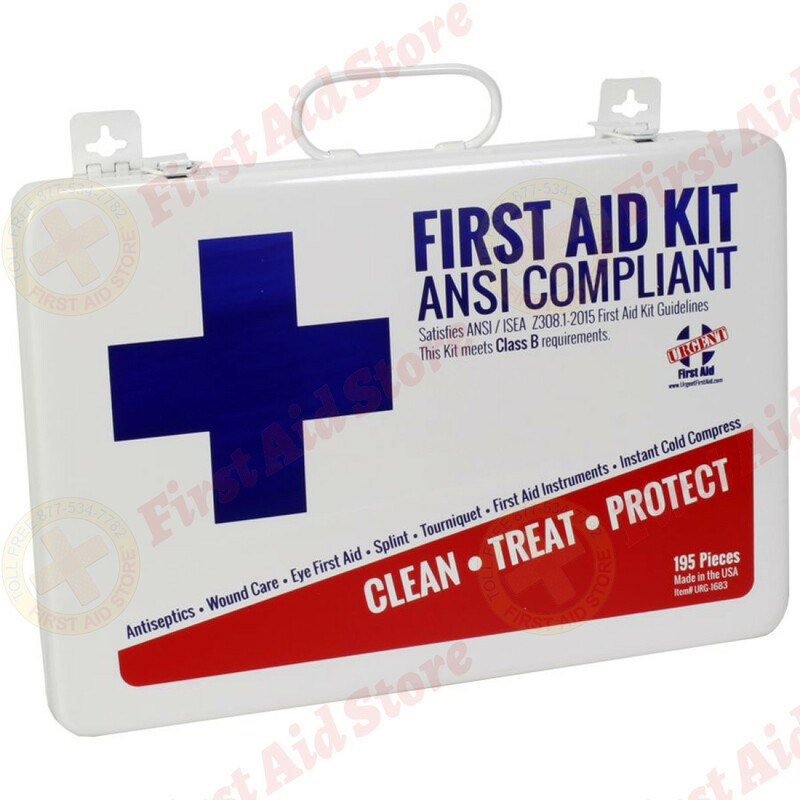 The most recent update to ANSI first aid kit standards (Z308.1-2015) was set forth on June 17th, 2015, with an effective date of June 17th, 2016. 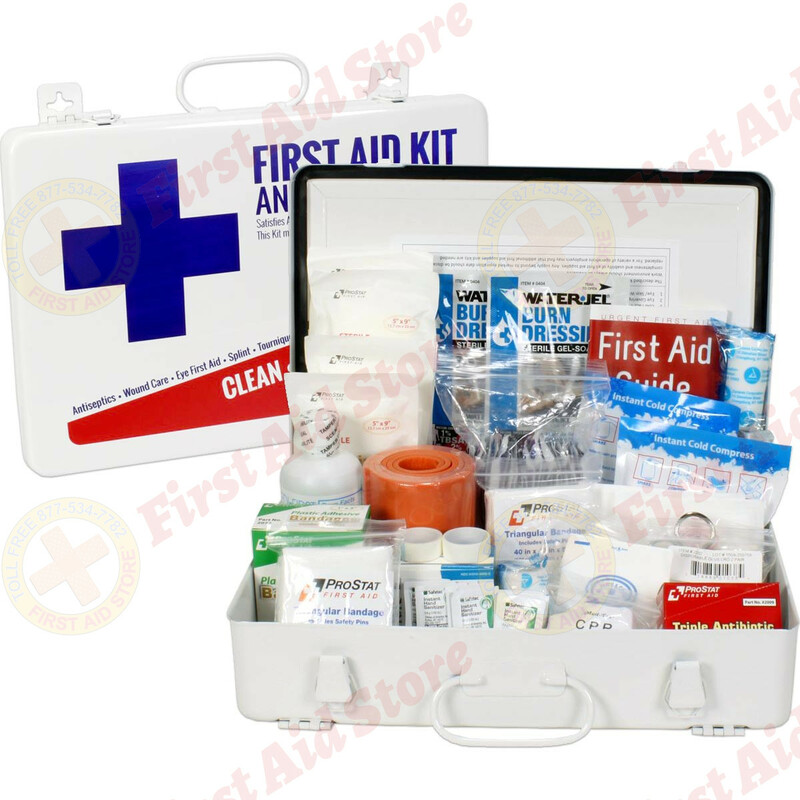 Within the new standards, the content of the first aid kit prevails in importance over the style in which it is packaged. 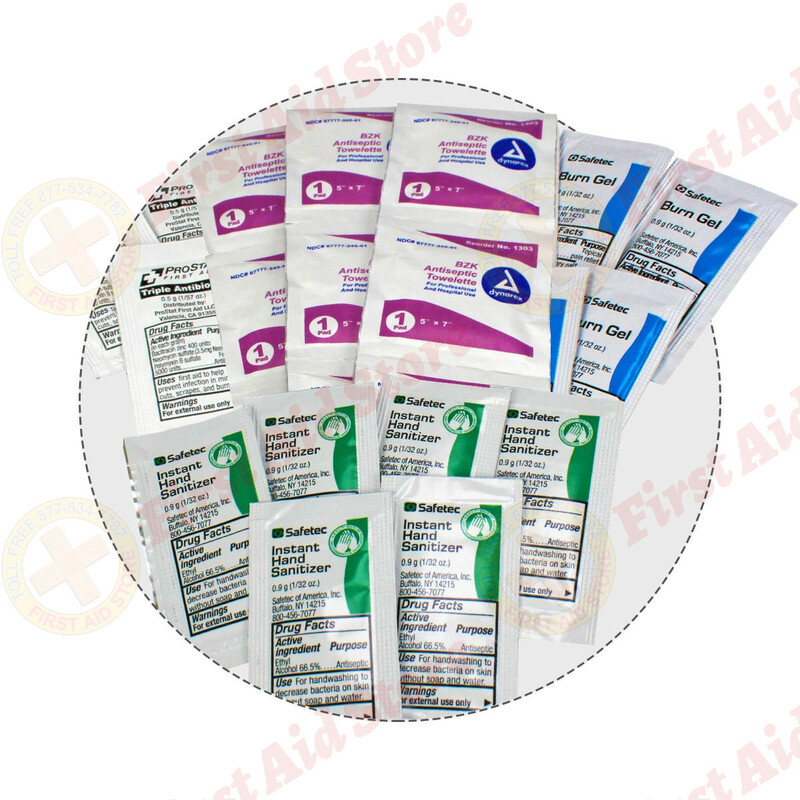 In previous standards, unitized boxes with color coding were required; after, bulk-style packaging was accepted. 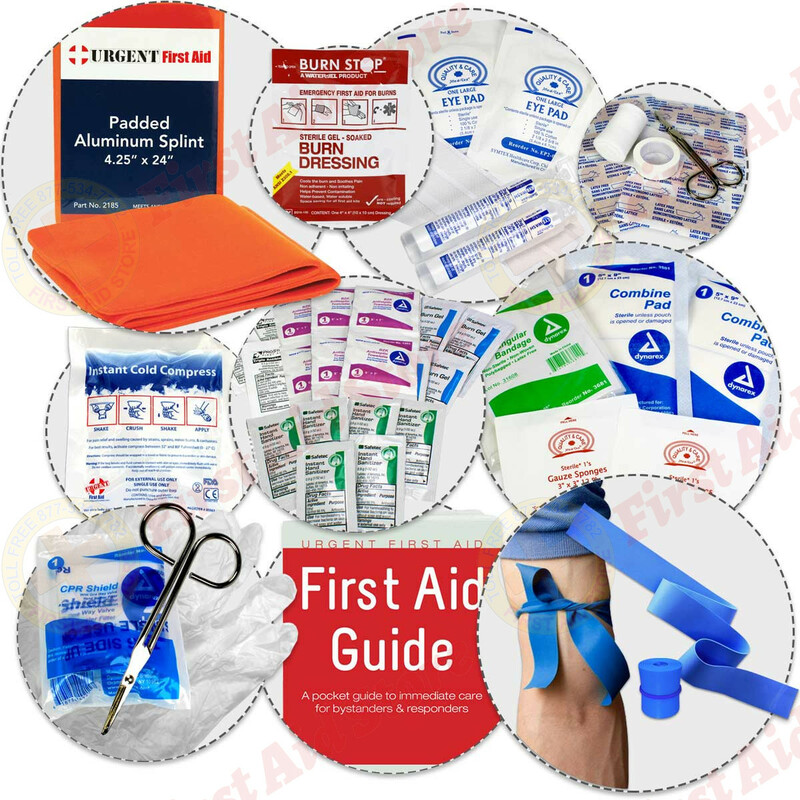 This new standards allow for either, but set specific guidelines for the content itself – including added pieces such as a CPR mask and burn supplies. 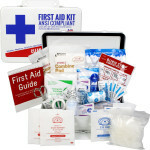 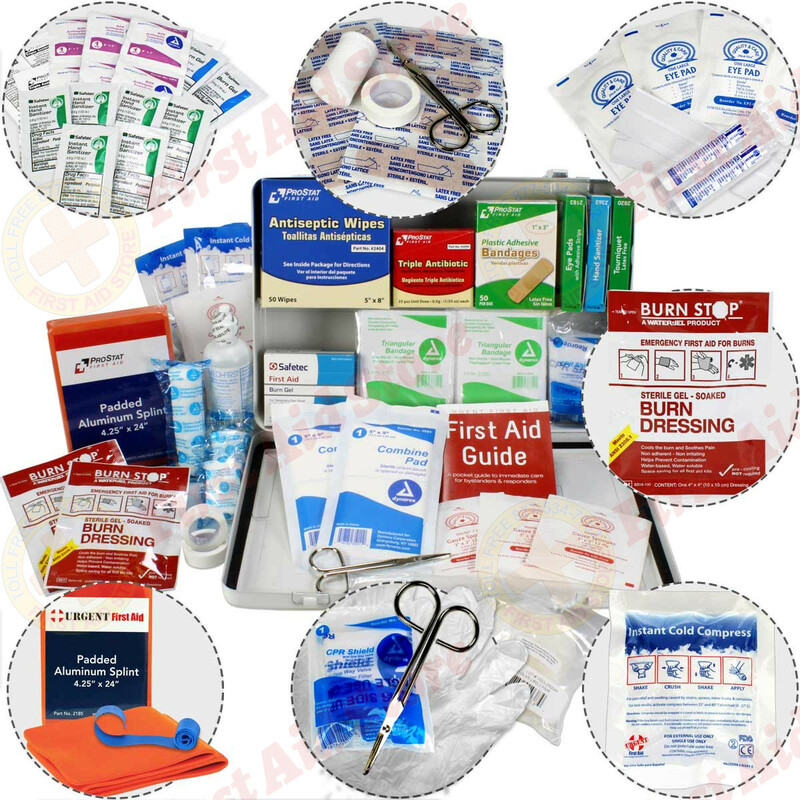 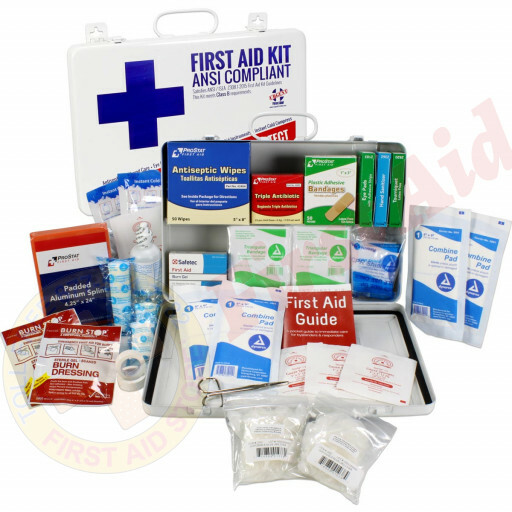 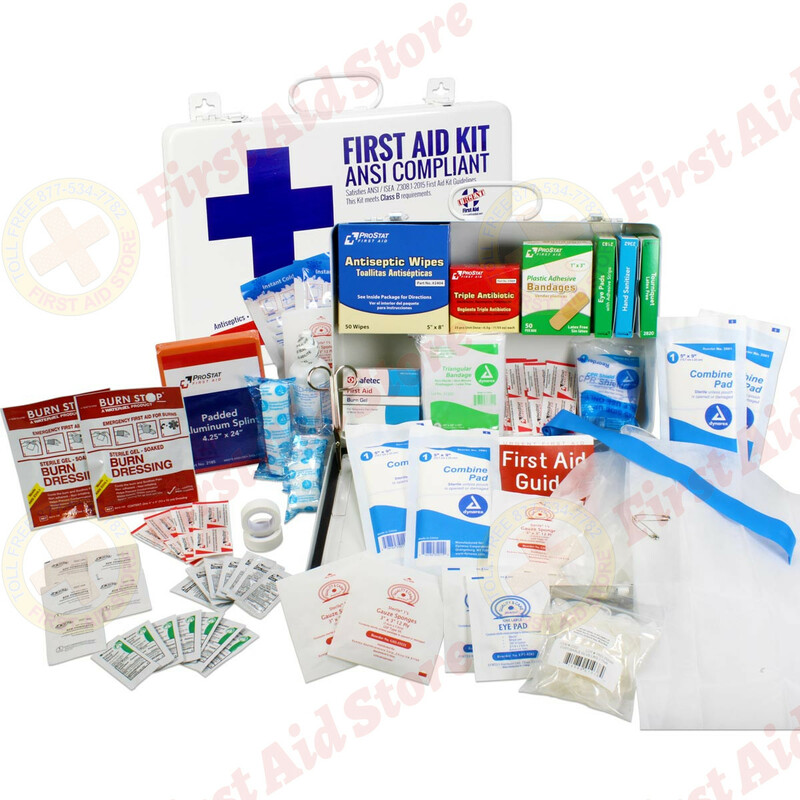 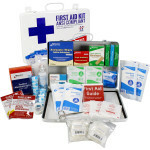 This ANSI First Aid box includes the assortment and quantity of first aid supplies intended to deal with most types of injuries and sudden illnesses encountered in the workplace including: major wounds, minor wounds (cuts and abrasions), minor burns, sprains and strains, and eye injuries. 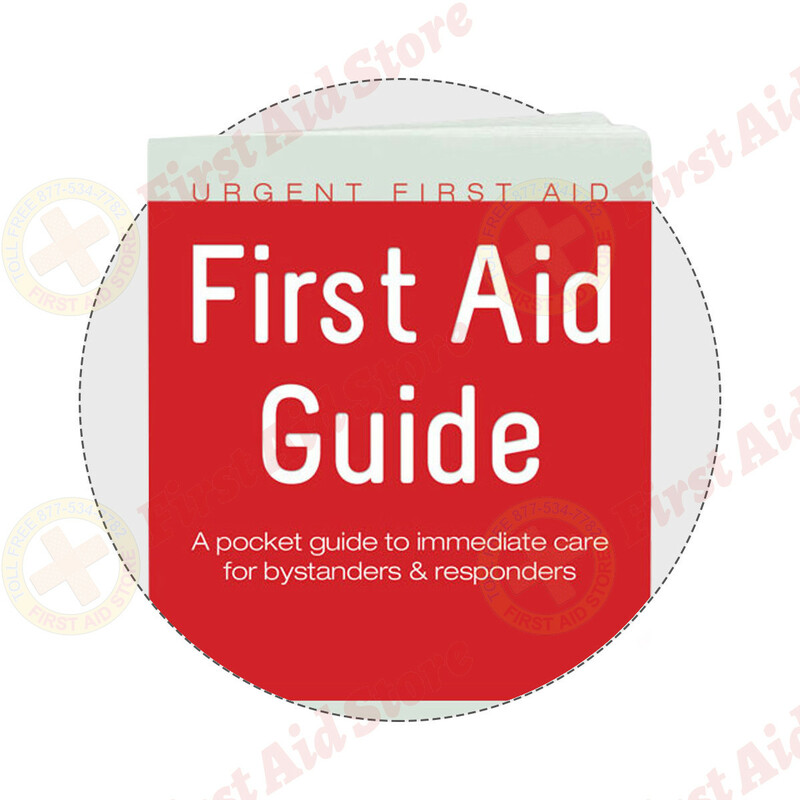 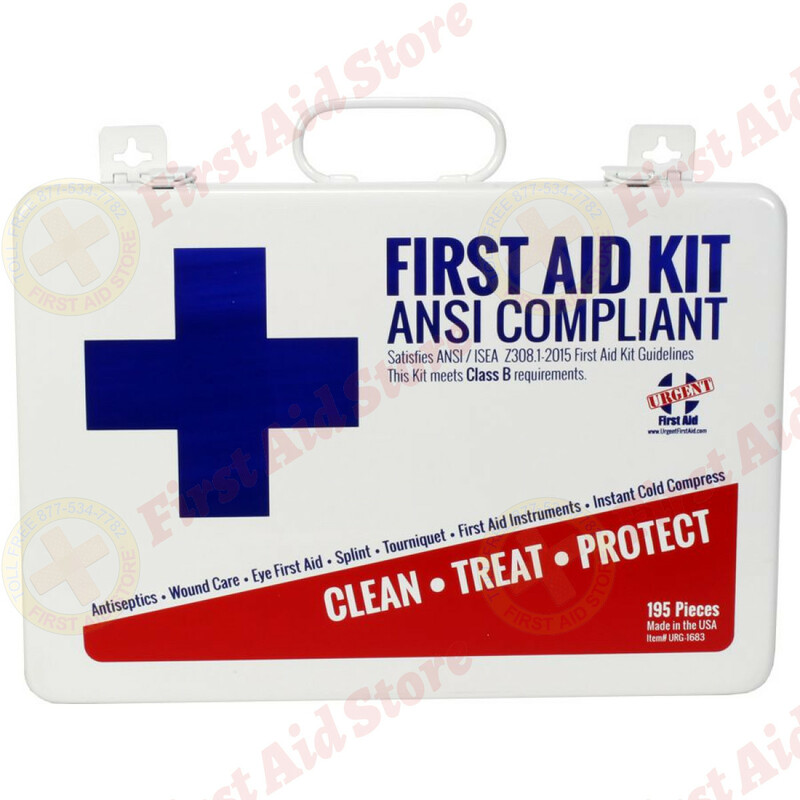 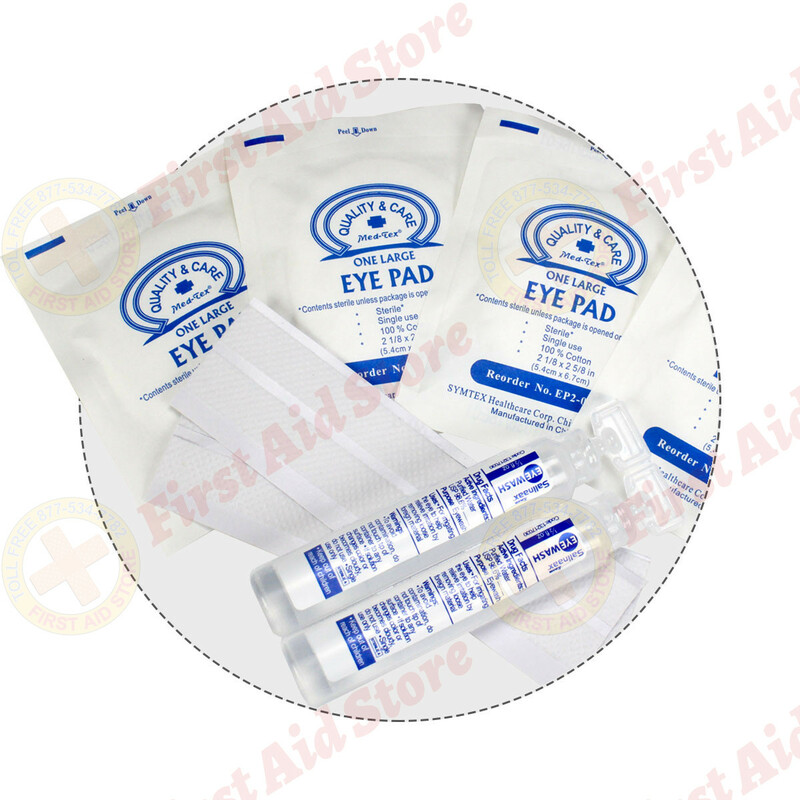 The Urgent first aid ANSI B kit is great for workplaces ranging from offices to production facilities and warehouses of up to 50 people, and is easily wall mounted, or removed to be taken to the accident scene. 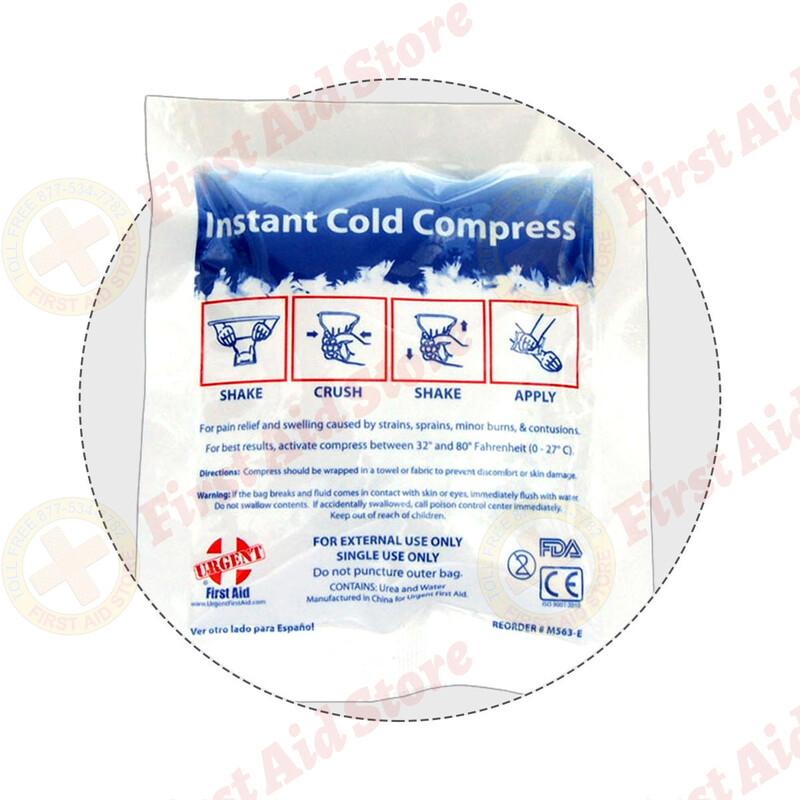 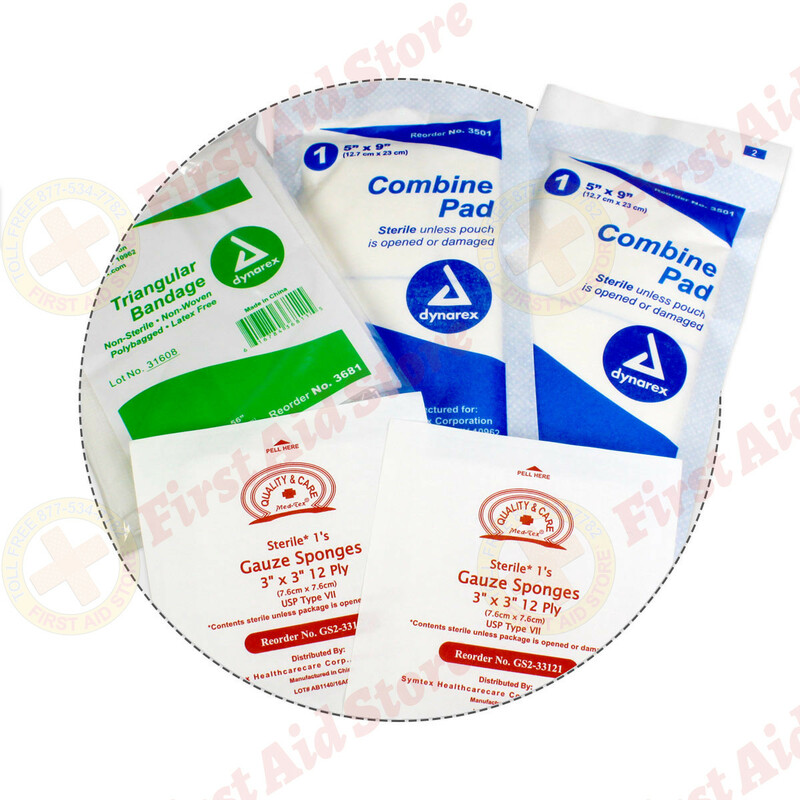 (2) URG-2016: instant Ice Pack 5" X 6"
(2) URG-3469: Burn Dressing 4" X 4"
(4) URG-2096: Gauze Pad 3"X3"
(2) URG-2458: Adhesive Tape 1/2"X 2.5yd. 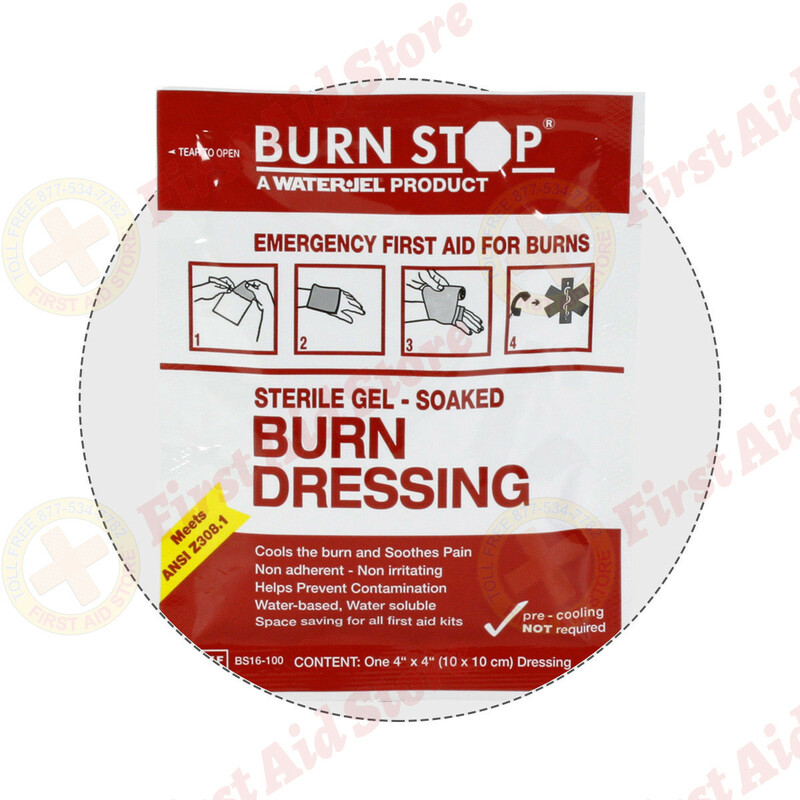 (2) URG-2504: Gauze Clean Wrap 2" X 4.1yd. 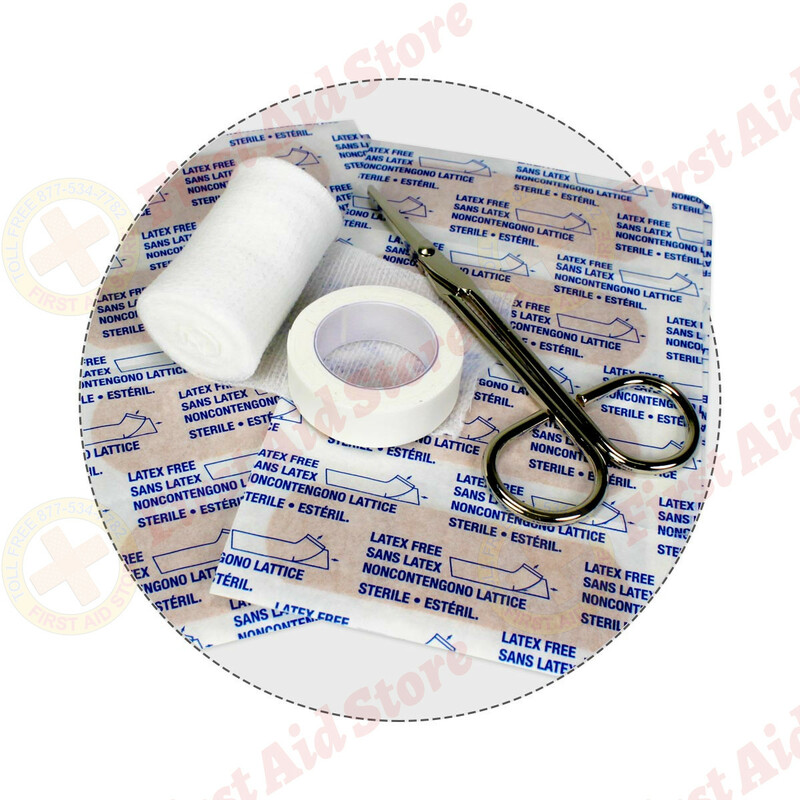 (1) URG-2504: Gauze Clean Wrap 3" X 4.1yd. 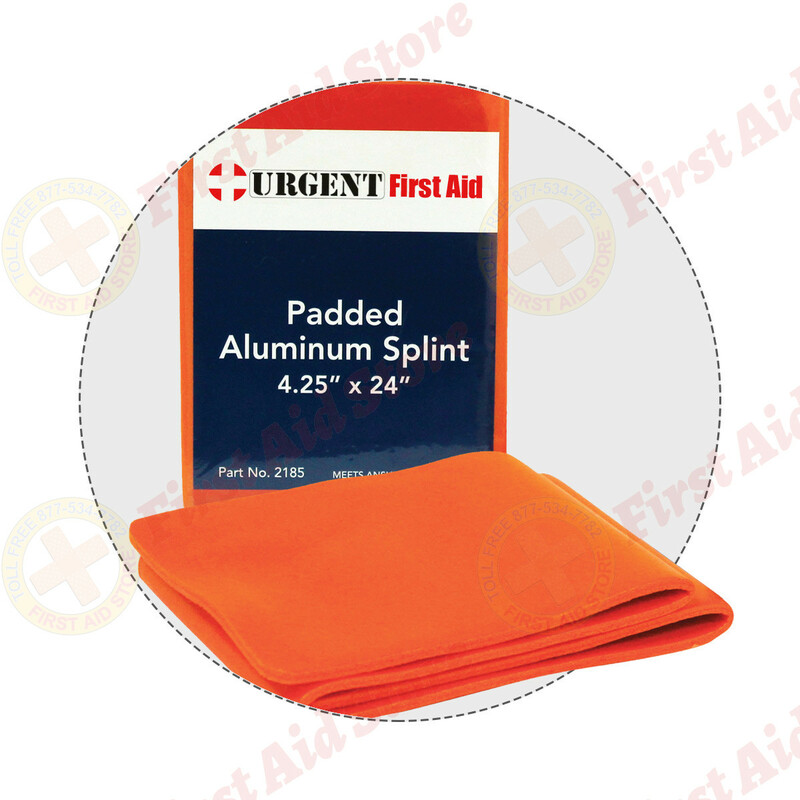 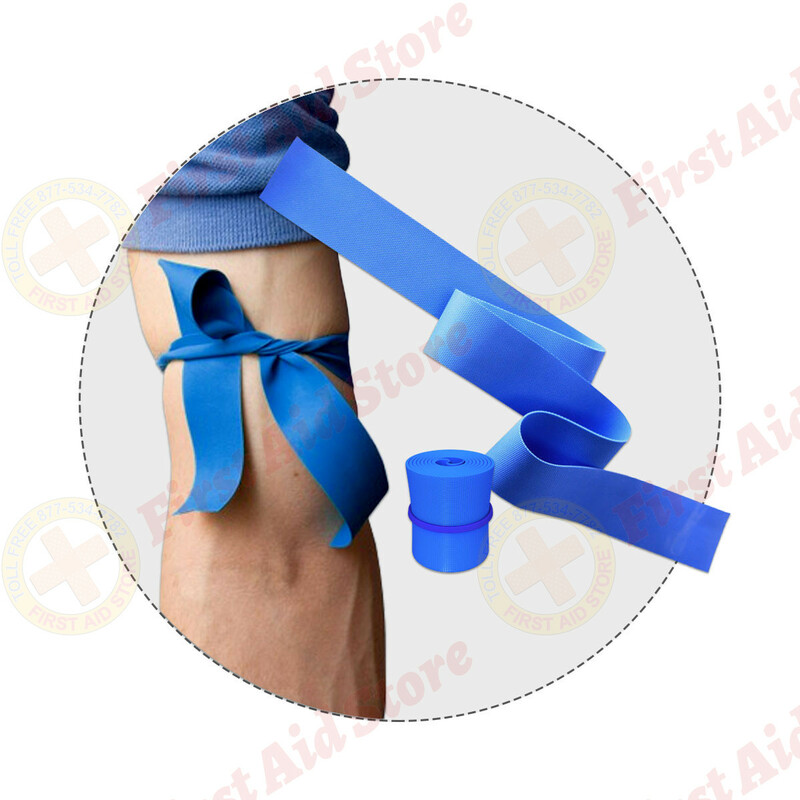 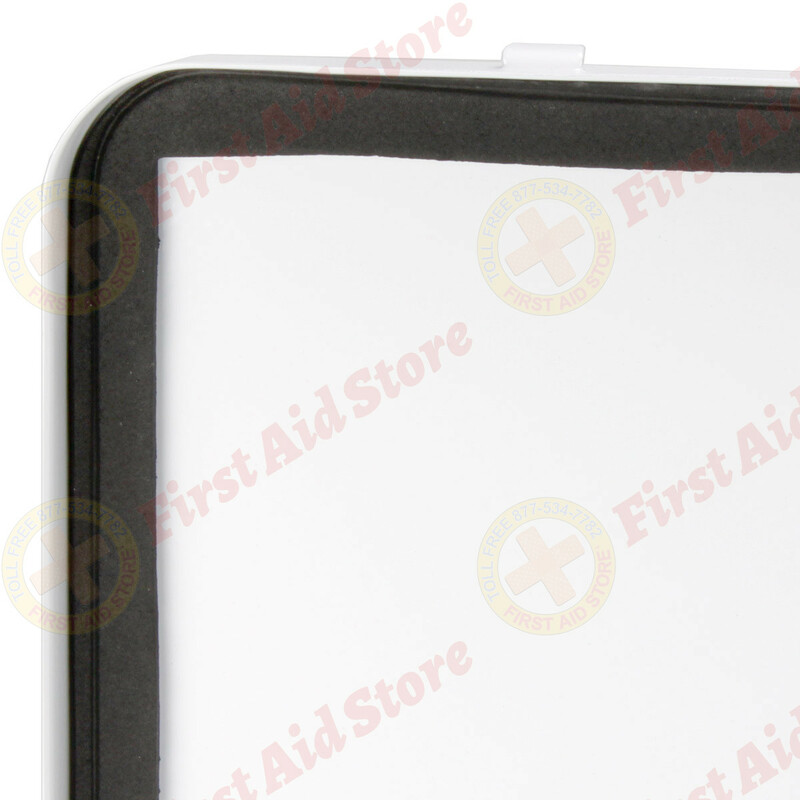 (4) URG-2541: ABD Combine Pad 5" X 9"
(1) URG-2933: Splint 4.25" x 36"
Kit Dimensions: 9.5" x 3" x 13.875"
The Urgent First Aid Kit, Bulk, Metal, 198 Pieces, ANSI B, 50 Person.